Canada has a well-diversified economy and can deal with the slump in commodity prices, most notably oil, according to Bank of Canada governor Stephen Poloz. “In terms of being excessively dependent [on commodities], I don’t buy that. 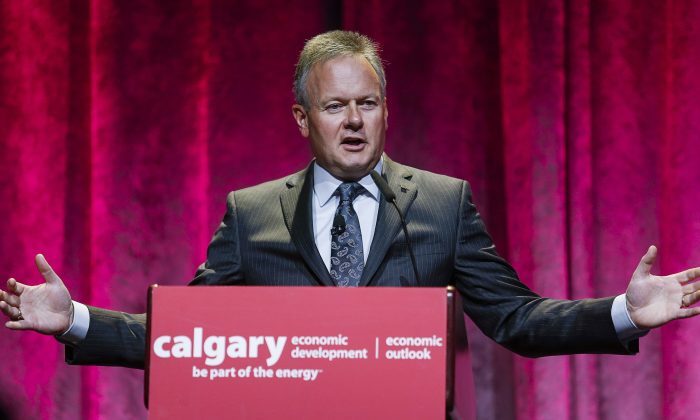 Twenty percent of our economy is the resource economy,” said Poloz in a Q&A session after his speech at the Calgary Economic Development’s 2016 Economic Outlook event on Monday, Sept. 21. Canada has seen its share of commodity boom and bust cycles. Poloz discussed how technological change plays a key role in these cycles. The main reason oil prices fell so much since last summer is that, “supply rose sharply, thanks primarily to technological advances in oil extraction everywhere,” said Poloz. “Inflation-adjusted commodity prices have generally been trending lower for 200 years,” said Poloz referring to how technological advances have found ways to raise output while lowering production costs. “What matters for a given investment is how prices evolve over the life of the project, which is impossible to know when long-term investment decisions must be made,” said Poloz. Companies invest with prospects of high prices. This greatly benefited Canada—and Alberta especially—until this year. Poloz explained that volatility in oil prices is due to most transactions being financial (speculative) in nature rather than being between producers and end users. Oil prices are thus more volatile than underlying fundamentals. The transition in China’s economy to slower, more domestically focused growth has reduced global demand for commodities. A great deal of skepticism exists around official figures of China’s growth. Is it truly 7 percent or something closer to 5 percent or lower? Poloz doesn’t believe it is slowing as much as some might suggest. “China is actually growing quite well. It’s gearing down to a more sustainable pace for the longer term,” Poloz said. It’s a process of a very large economy maturing, he explained. We should be thankful that we’ve got resources as part of our diversification whereas lots of other countries don’t have that. The question then becomes how and what Canada can continue selling to the world. As China and emerging market countries play catch-up with developed countries in urbanization with growing middle classes, the demand for agricultural and seafood products grows, to give one example. Poloz feels Canada is well positioned noting, among other improvements, that seafood exports to China rose by 11 percent when comparing the first halves of 2015 and 2014. The extreme movements in energy prices is also forcing the central bank to rethink how it measures inflation since total inflation, which includes energy prices, is being pushed down, while core inflation—removing volatile components like energy—is moving up due to the rising prices of imports. But even with core inflation, there are temporary effects, and so the BoC strips those out to arrive at an underlying inflation trend. This trend is in the range of 1.5 to 1.7 percent, below the 2 percent target. Poloz reiterated that, by promoting low and predictable inflation, the Bank of Canada will aid the economy in returning to stronger growth. The central bank also acknowledged the weaker loonie helped absorb some of the impact of lower commodity prices in the Bank’s Sept. 9 statement. The challenges for the resource sector are expected to take a long time. The BoC’s monetary policy has responded with two rate cuts this year. On Wednesday, Sept. 9, the BoC kept the overnight rate target at 0.50 percent feeling inflation and economic growth were in-line with July’s projections.